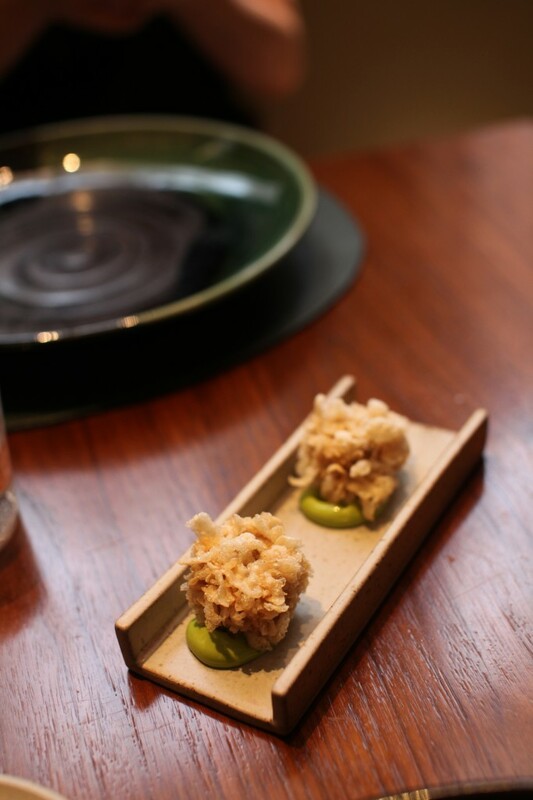 Stewed rabbit with lovage was the first of the three amuse bouches. Tender, flavoursome rabbit had been encased in fried tapioca, and the result was a crunchy ball of delight. A lovage emulsion provided an element of earthiness to the rabbit. Although the rabbit was a touch salty, this was a beautiful ball of flavour. Some cured mackerel with seaweed, pickled cucumber and a horseradish cream tantalised with its freshness and brightness. 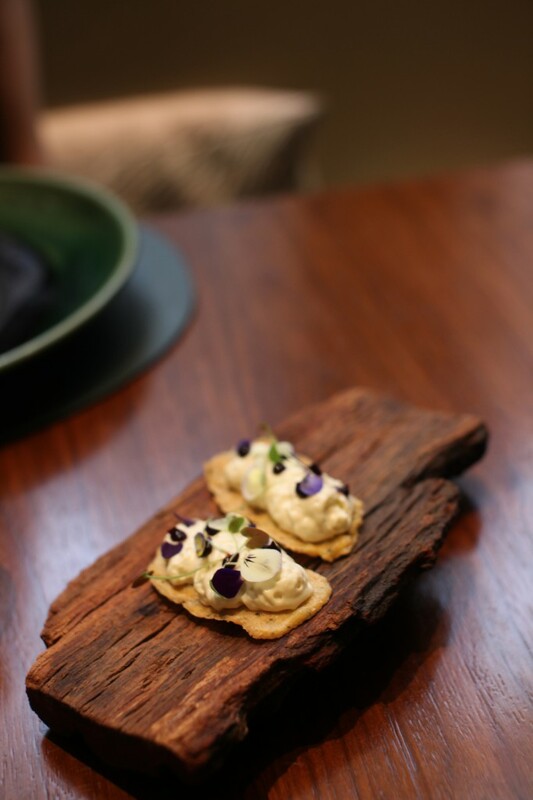 There was a lovely balance of acidity and sharpness to the mackerel which had been served on a crunchy seaweed cracker. 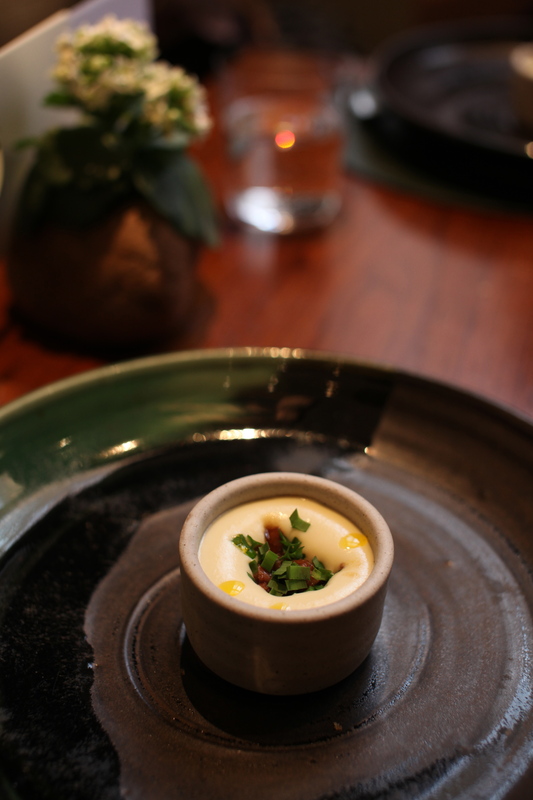 ‘Tunworth and potato’, a Tunworth cheese and potato emulsion filled with confit duck, came in a little bowl and was simply glorious. This was a little salty, but regardless, this little mouthful of food showed off an exulted elegance. The emulsion was light and airy and the duck was beautiful and flavoursome, resulting in a harmonious matching of minds. It was simply perfect. 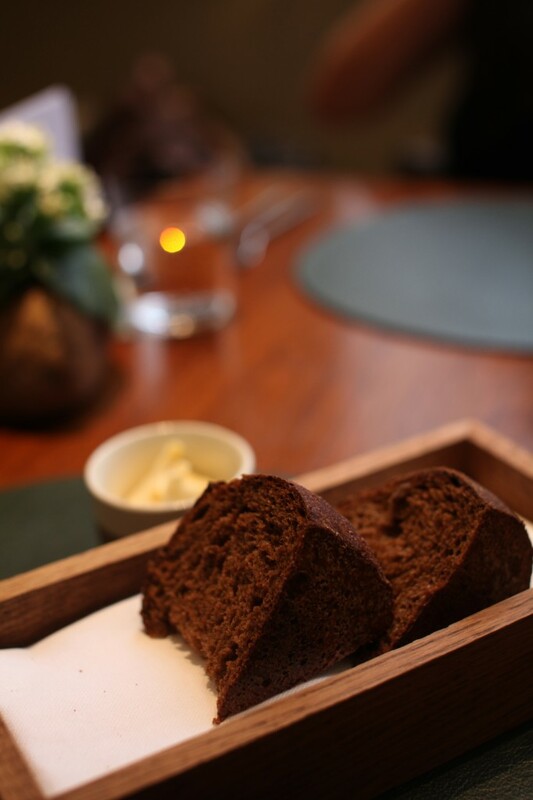 We were served a stout bread next accompanied by a carmelised butter. The bread was fabulous with a crunchy exterior and a warm soft centre. The butter had been caramelised using a mixture of brown nut butter which gave it a glorious nutty sweetness that worked perfectly with the gorgeous flavour of the bread. Swede dumplings with an Isle of Mull cheese sauce was our first course, and this was the height of sophistication. The dumplings were light and fluffy and they married beautifully with the cheese sauce. The sauce was complex in flavour, with sharp, tangy and fruity overtones resulting from the use of the cheese. The sauce was in turn balanced by a delicacy and lightness attributable to its skillful preparation. 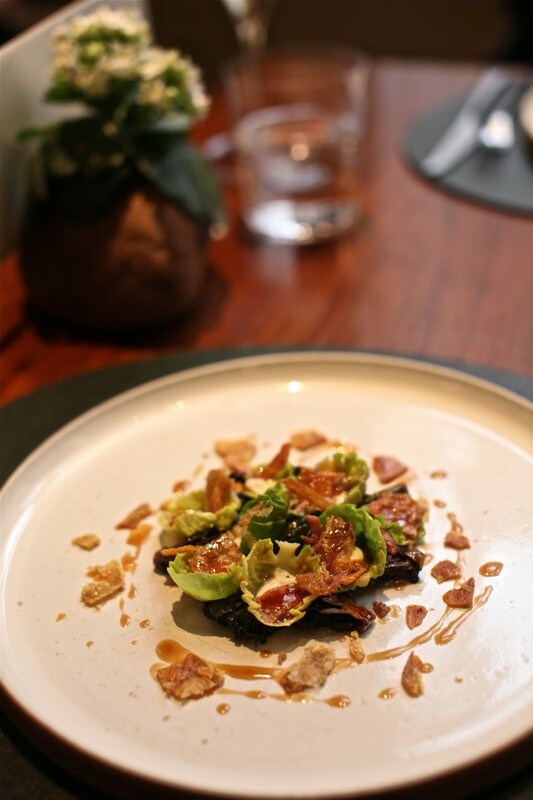 As garnish, there were some fresh kale leaves and gorgeous truffle shavings. The dish was a little salty, but overall this was an incredible plate of food and a joy to eat. Organic carrots, pureed and pickled, came with some delicately salted ox tongue and pickled mushrooms. It was a dish of contrasts, between the slightly salty ox tongue, the sweetness of the carrots and the acidity of the pickled vegetables. To temper the dish was a lovely buttermilk emulsion. The next dish was a lovely plate of crunchy freshness, with fried sprouts being accompanied by slivers of crispy chicken skin. On the plate was some beautifully smooth broccoli cream, a dill emulsion, and a drizzling of perfect chicken jus that highlighted the seasonality of the dish embodied what Simon does best – fresh, seasonal, earthy and full of provenance. We ordered an extra dish of cold smoked lobster (£27) from the a la carte menu. The lobster was wonderful and sweet and had been paired with a delightfully tangy pickled kohlrabi, a delicate apple jell and a heavenly apple tarragon sauce. To complete the dish was a sprinkling of buttery and crunchy ale breadcrumbs that accentuated the flavour of the lobster beautifully. 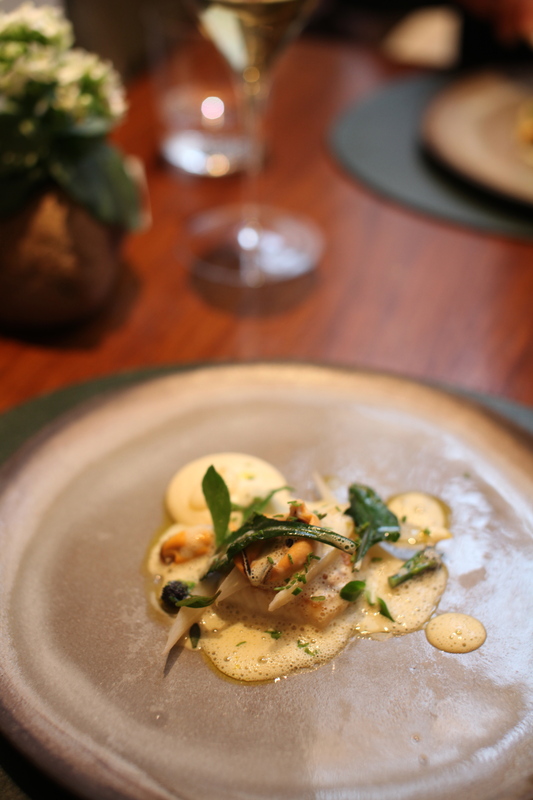 Sea bass in brown butter with mussels and salsify was a skillfully prepared thing of beauty. The sea bass was perfectly cooked and the mussels were sweet. 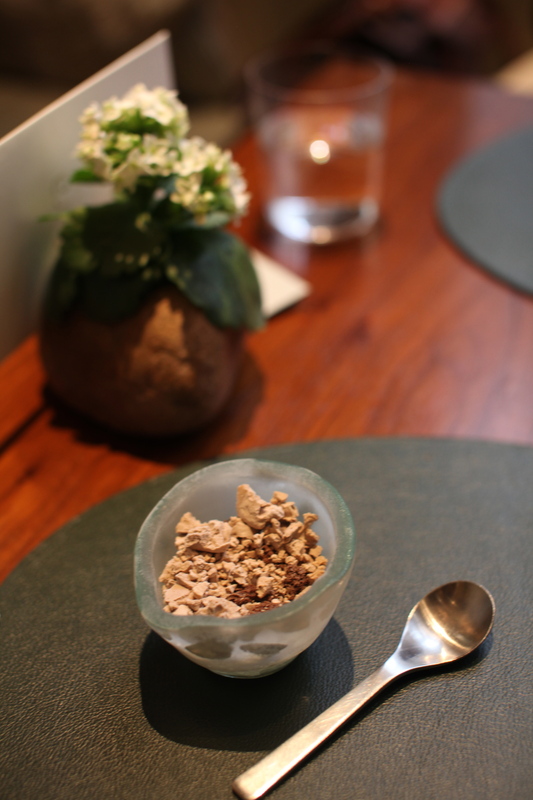 The salsify had been prepared two ways, whole and as lovely sweet puree. Also accompanying the sea bass was mussel sauce and which was tremendous and some delectable sea herbs. The meat course was beef two ways, fillet and short rib, both of which were thrilling on the palate. The beef fillet was as tender as they come and cooked to a perfect medium rare. The ribs were also delicious, made more so by a scrumptious perimeter of crunchy fat running across the surface of the ribs. 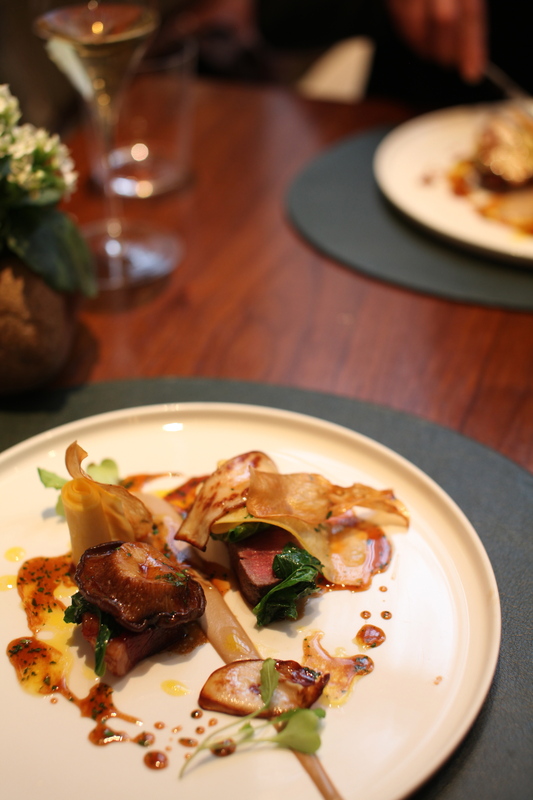 To round of the dish were some lovely mushrooms, spritely turnips and an unctuous bone marrow sauce. 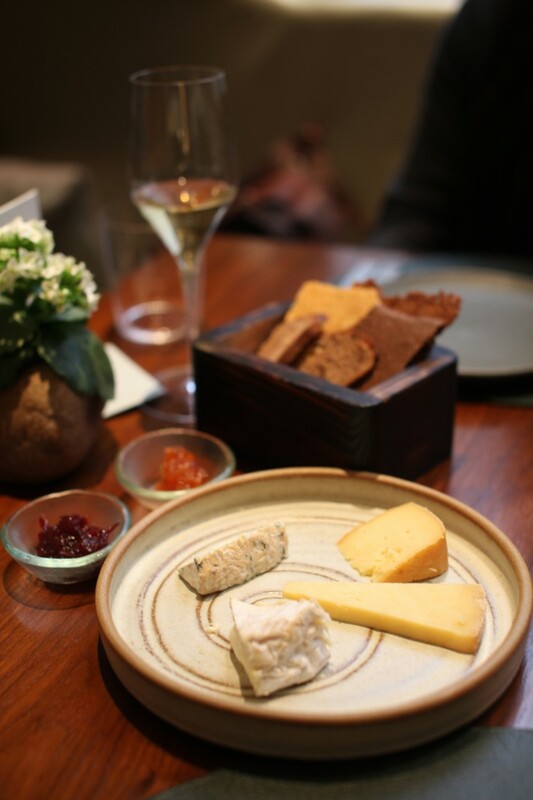 An additional cheese course of British and Irish cheeses (£14.00) included a lovely Bartlett sheep’s milk cheese from Somerset, a gorgeous Tunworth camembert from Hampshire, a mellow Haford cheddar cheese from Wales. Chutneys included red onion and pear and carrot, both of which were delightful. Homemade crackers included bran, fennel and malted barley with sea salt, and some fruit bread. All of these were really enjoyable, particularly the malted barley with its slightly nutty, salty flavour and amazing texture. The pre-dessert was ‘chocolate malt nitro, prune and dandelion’, a delightfully refreshing malt which had been frozen in liquid nitrogen which gave it a chocolately flavour. This was paired with some dandelion root cake and prune jam. 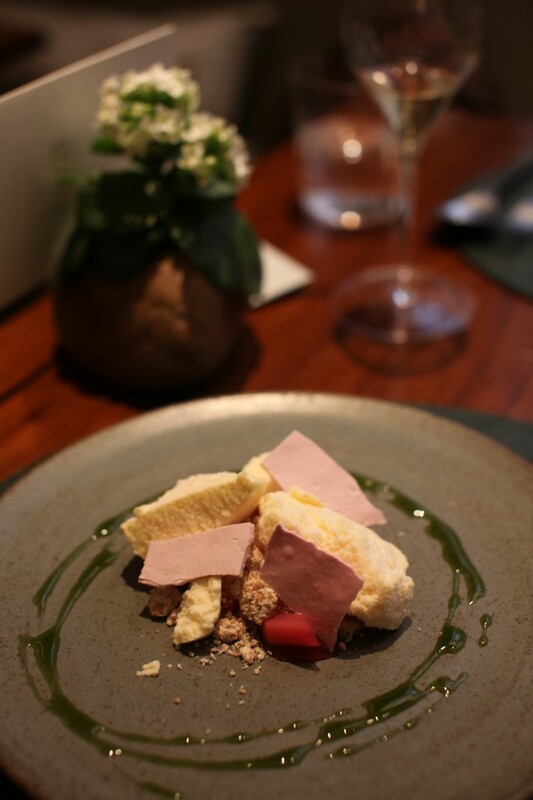 The dessert was also a refreshing concoction of aerated sheep’s yoghurt with forced rhubarb and oats. Slow cooked rhubarb had been paired with a mesmerising crumble made from oats, a delightful brown nut butter and green verbena syrup. There were also some fluffy pieces of rose meringue. We would have preferred some ice cream with the dessert for a bit of wetness on the palate, but otherwise this really pleasant to eat. 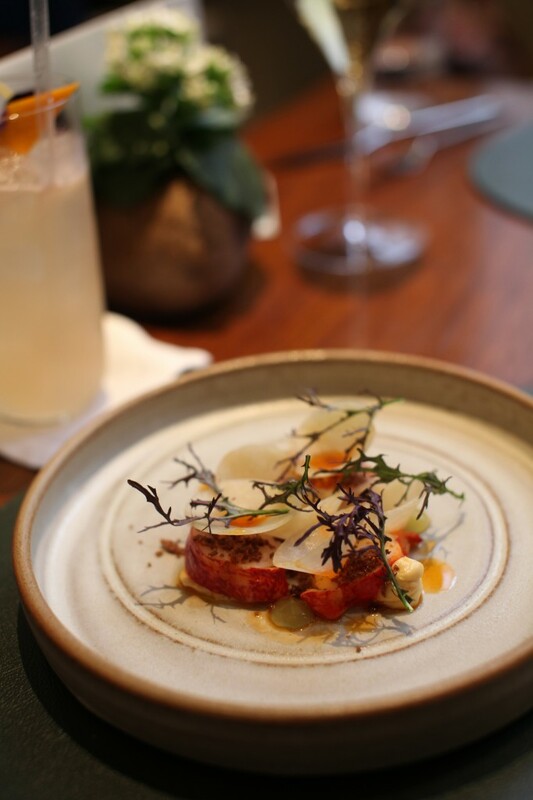 Fera was an experience unlike any other. Dazzlingly creative and thoroughly inventive, each plate of food embraced the essence of nature and embodied the beauty of the best of the best ingredients. 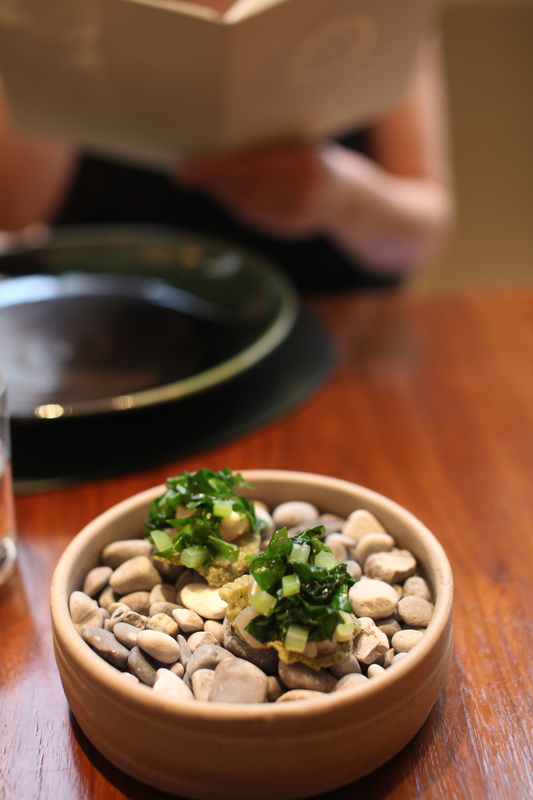 There was no doubting the brilliance of Simon Rogan, and some slight seasoning issues aside, this was one of the most memorable menus that I have had in a very long time. The service was attentively thorough and professional to round off an almost perfect dining experience. 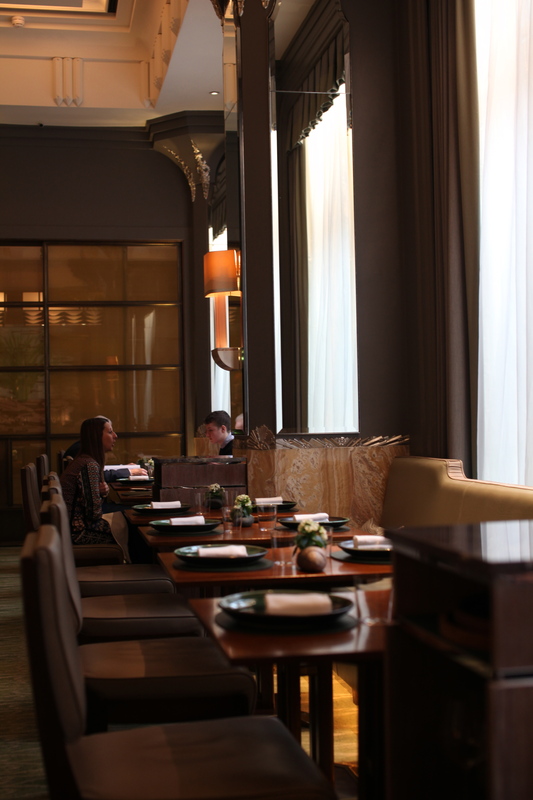 On its own merits, Fera deserves two Michelin stars and it beggars belief that it hasn’t been given such a distinction. And if you compare it to the fact that lesser restaurants such as Barrafina and Arbutus also have a star, then Fera deserves its second star even more so for it is head above those two. 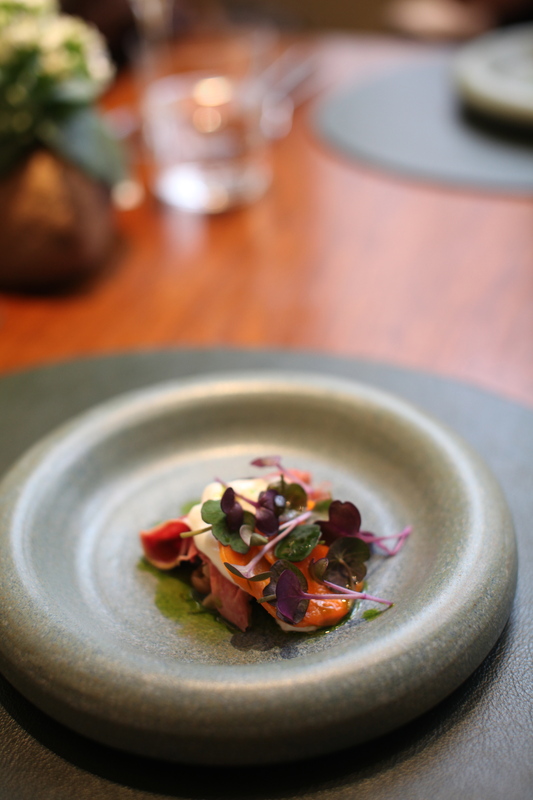 Fera is in a completely different league, and this oversight makes a mockery of the Michelin rating system. I personally feel aggrieved for Fera and I can only hope that Michelin will right this injustice this year. 3) Sophisticated and elegant ambience. 4) One of the best meals I have had in a very long time. 1) Slightly over seasoning in some dishes, but otherwise the food was pretty perfect. 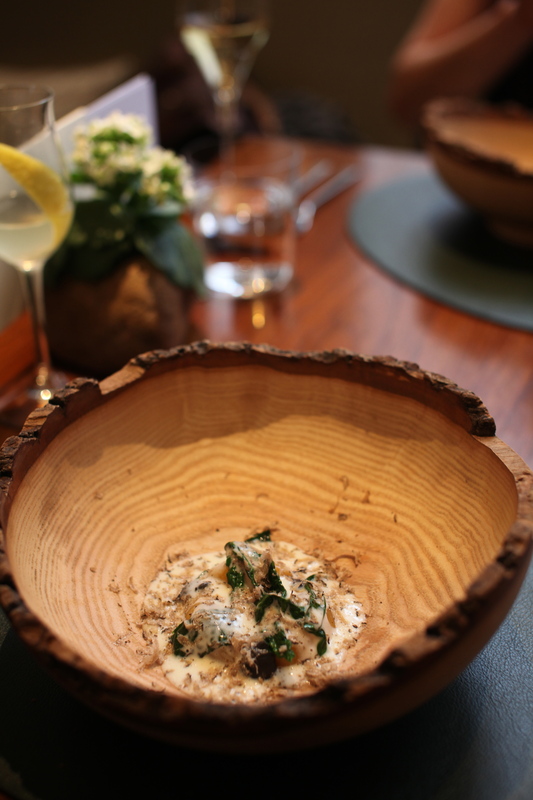 2) The fact that Fera does not have two Michelin stars.